USA Today reported yesterday that the Facebook version of Angry Birds had a flunking score of 65 in terms of respecting users' privacy, according to a group called PrivacyChoice. PrivacyChoice gives the same app a glowing 89 (check it yourself). 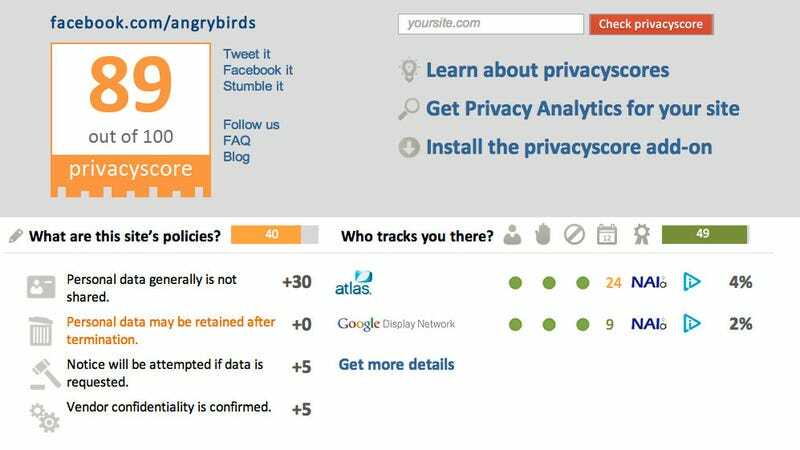 The Angry Birds folks "amended their policy, as did one of the companies collecting data on their site," PrivacyScore's Jim Brock told Kotaku. We've got a follow-up in to him to find out what was changed. We've also asked Angry Birds studio Rovio what's up. PrivacyChoice reports that Playdom's and EA's apps are better at respecting privacy than rival Zynga's. Companies get lower scores, Brock told Kotaku, due to "a relative lack of protective provisions, like ensuring that personal data is deleted after account termination, and second, more extensive tracking by ad companies that have low privacy qualifications (like not participating in industry oversight programs)." He declined to compare the specific privacy policies of gaming companies EA and Zynga. The images in this post are from PrivacyScore.com.